It probably seems weird to have me continue posting about Christmas, but I didn't have a chance to share everything I wanted to. Even though I knew my job at Heritage would require me to help with their Christmas play as we got closer to the performances, I had no idea how time consuming it would be. I spent about three weeks staying into the night to help with final rehearsals and the performances. There were moments when I though my little business that I had worked so hard to grow for so many months would just fizzle out because I was so busy. 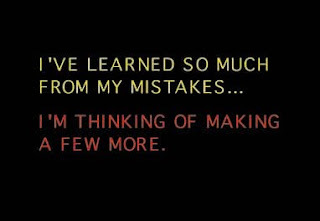 Papernstitch recently wrote about mistakes on their blog and it made me start thinking about what I've gained from making mistakes. 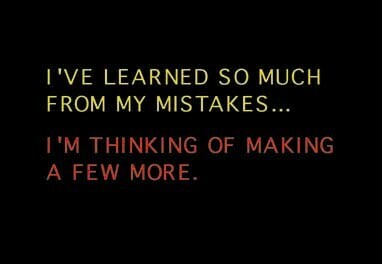 I would be a much different person without the mistakes that I have made and even the mistakes other people have made that affected my life. I have been weaving for over 20 years. I am a musician as well as an anthropologist. I enjoy studying prehistoric weaving implements as well as prehistoric textiles. I am inspired by the work of prehistoric weavers who wove incredibly beautiful textiles. I also sometimes mix science and art in my pieces. I love to create textiles that are ‘one of a kind’. I also get inspiration from nature, and I enjoy dyeing fibers using natural dyes. I really love seeing how different colors and textures come together in a project. For those of you who have been reading this blog for awhile, you already know my feelings about the Alchemy feature on Etsy. An update from Etsy this week claims over 80,000 custom items were made by connecting buyers with sellers to work on ideas. At first I was worried that Etsy was giving up on the idea altogether. Alchemy had some serious problems, but I liked the idea of having a forum for people who had ideas to find someone willing to take on the project. Etsy has set some phase out dates over the month of February for the current Alchemy area and then it will be completely gone while they figure out the changes they're going to make. No target completion date has been set. Christmas gave me some great opportunities to share my tatting. I hosted an ornament exchange and made a different ornament for each person. My favorite was the basket I tatted in green variegated thread. I even added some beads to sparkle it up a bit. It was so hard to send it off after I made it! No, I haven't decided to spray paint my initials on the sides of buildings and boxcars. I decided it was about time to discuss the use of tags on the items in your Etsy shop. What exactly is a tag? When you list an item to sell on Etsy, you are given the opportunity to add 14 tags to the description. The tags are labels, keywords, or descriptions of the item - color, style, materials, etc. Why are tags important? In the posts for one of the Etsy Teams I'm on, someone asked, "How important is it to use all 14 tags?" It's extremely important! Search engines and Etsy's own search feature read those tags and decide if they match what customers are searching for. The more specific terms you use, the better match you will be for people searching for items like yours. For my first Feature Friday, I'm featuring someone who I have been following for a few months. Back in October, I wrote a post about Jemyl and the tough times she was having. Ellen L. "jemyl" Johnson lives in northeastern Florida. She has had some physical ailments that have plagued her over the last six years and she depends on selling the jewelry she makes in order to supplement her limited income. Like many of us, making and selling handicrafts is a creative outlet and a means of support for her. A few months ago, I posed the question - To Tweet or Not to Tweet? At the time, most of the feedback I got steered me away from Twitter. So many people thought it was a huge waste of time. Because I wanted to be familiar with all popular social media platforms, I knew I had to at least give it a try and learn some of the lingo. Signing up was easy enough, but I was quickly overwhelmed by what to do next. The first big challenge was to learn to limit myself to 140 characters and spaces for each tweet. As a Facebooker, I'm used to being able to say a little bit more at a time. I admit that I have even reached the limits for Facebook a few times. I want to start featuring other Etsy sellers on a regular basis. This may sound a little crazy since I would essentially be helping out the competition, but I believe that helping other sellers can help all of us. Surely I'm not the only one experiencing the Etsy madness. What experiences have those other seller had that can help me? Do they know about resources that I don't? What tips would an experienced seller offer a newbie? My goal is to do a Feature Friday blog post every Friday and feature a different seller for each one. If you'd like to be featured, send me an email at nativeandpilgrim(at)gmail.com. Let's face the Etsy madness together!! In case you've been wondering where I've been, we've had some family problems recently. My husband had an accident that totaled our truck and left him with some head injuries. Fortunately, he's recovering well enough. The very same day, my husband's dog jumped the backyard fence and got out to a busy road where she was struck by a car and killed. Losing her was a big loss for our family and we are still reeling from it all. Now that we are past the worst of it, I am turning my attention back to all of you. We have so much to learn in the next year! Even though it's good to plan out your marketing strategies, some opportunities happen when you least expect them. We had some interesting marketing opportunities during the Christmas shopping season. I used to be pretty shy, but the need for some income helped me to be brave and find new ways to promote our little business. As a member of our chamber of commerce's Women's Business Network, I was asked by one of the other businesses to make nine necklace and earring sets. They were sponsoring a table at the annual holiday luncheon and needed to provide gifts for each of the women at their table. I made the jewelry sets at a discounted rate and my hubby was kind enough to design custom ornament shaped gift bags to place them in. My business card not only went to each of the recipients, but the gifts themselves started some great conversations. The other unforeseen opportunity came as a result of my hubby, Cricut Man, deciding to goof around with some empty Diet Coke cartons. 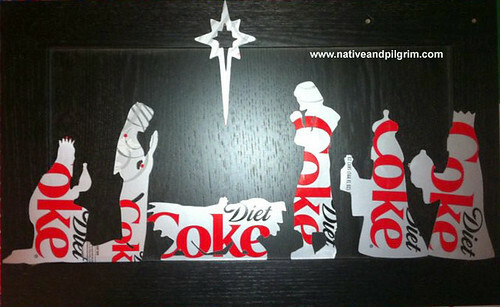 His addiction to Diet Coke knows no bounds and he managed to cut a nativity scene from the empty cartons. When we shared the picture on Facebook, we were surprised when some of friends wanted to buy a set. The surprises didn't end there. While we were out Christmas shopping, I heard one of the local radio personalities talking about her own addiction to Diet Coke, so I texted her a link to the photo of the Diet Coke nativity scene. After some texting back and forth, she called me and ordered three nativity scene sets from us for next Christmas. Opportunities are everywhere, friends! Make sure you're ready when you see a chance to market your business. ALWAYS have business cards with you. No matter how memorable you think your business name or website address is, most people are going to need that business card to find you online. Keep product photos on hand. This could be photos kept on your phone or connecting to your Etsy site if you have an Internet capable phone. Don't have a cell phone? Carry a small photo album with you in your purse or bag. Let your friends, coworkers, and others you meet know that you have your own business. This is no time to be shy! You want them to think of you when they're looking for gift ideas. Wear/use your own merchandise. Every time you receive a compliment on it, you'll be able to mention your shop. People are also more likely to buy things when they've seen them in use. Keep your eyes and ears open for opportunities. Some blogs have linky parties that allow you to promote your business. Look for Facebook pages where you could post a picture (I posted a picture of the nativity scene on the Diet Coke Facebook page). Twitter is also a great place to connect with people. Don't be afraid to jump into conversations if you think your shop/product/service could help. When people see my work, they often comment that they wish they had some sort of talent. I find that ironic since I grew up thinking I had no real talent. Sure, I was good at academic stuff, but I didn't think I was good at anything considered a talent. My dad was an artist and it really bothered me that I couldn't draw or paint to save my life. There was no way I would have believed that one day I would be playing around with Photoshop and creating posters and invitations. I still can't draw something from scratch, but I have developed a talent for putting things together and altering other images to fit what I need. Everyone has some kind of talent. It's just a matter of discovering it. One of the best ways to figure out what you're good at is to ask your closest friends and coworkers. Talent isn't limited to sewing, art, crafts, sports, and so on. You may be the person everyone sees as being highly organized or the person who can solve problems in almost any situation. Are you the person who can teach others or the one who people go to for advice? All of these are talents and you can use them. In one of my business management classes a few years ago, we did a series of exercises to help us figure out what our career area should be. What surprised me was that it wasn't only about discovering our aptitudes. The best indicator of career success was enjoying your work. My oldest son is an interesting example of this. He's every bit the geek, doing complicated math in his head, modifying iPhones and PSPs without fear, and working his way around computers like no other. 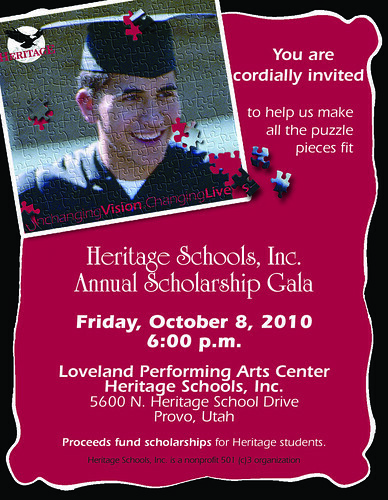 Even though we expected him to pursue some technological career, he ended up pursuing training in culinary arts. We never even saw that one coming! He loves cooking and experimenting in the kitchen and ended up rising to the top of his class and becoming the sous chef (second in command). 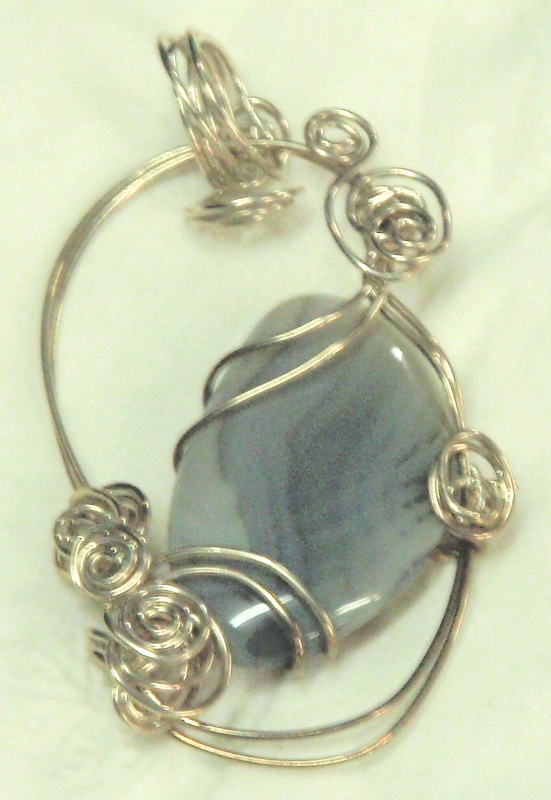 One of the great things about having an Etsy shop is that I can see and appreciate some of the talents I have. Some are obvious, while others are behind the scenes. In addition to graphic design and tatting (visible in the shop), I have organizational and business skills that keep us up and running. My marketing skills have helped me to connect with others on Facebook, Twitter, on this blog, and in person to raise awareness for Native and Pilgrim and increase business. In December, this all came together as one of my business contacts ordered nine tatted necklace and earring sets that were to be used as gifts for a holiday event. 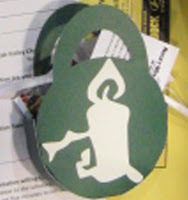 My dear hubby (Cricut Man) designed and made the coolest ornament gift bags to put them in, making a great conversation starter at the event. Write down three times where you enjoyed what you were doing and give some details. As you tell about what you were doing (in detail) and what made you happy about it, you will notice some of the things you do well. Write down compliments people have given you. 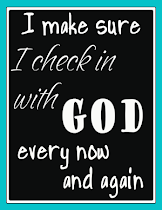 Ask several close friends, family members, and friends to tell you what they think you are good at or enjoy doing. As you look over the results, you should see some patterns that will point you in some direction. This is a good exercise to do periodically since our talents change over the years. What interesting talents did you discover you had?